Violence against women is a global pandemic and somehow seems directly proportional to discrimination against women. 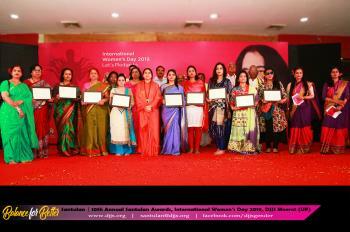 To raise awareness about one of the worst consequences of gender discrimination and commemorate International Day for Elimination of Violence Against Women, Santulan – the Gender Equality program of Divya Jyoti Jagrati Sansthan (DJJS) conducted a workshop named, "Astitva" on November 25, 2014 at M.D. School, Tibba Road, Ludhiana with the teachers and students of higher classes. The premise of the day was to sensitize young minds to their self worth and be vocal about what derogates their status. The workshop was based on the 3-tier methodology to combat violence and discrimination – Apradh Bodh (acceptance is self-offence), Adhikar Bodh (I must know my rights) and Astitva Bodh (who am I). An activity, highlighting role of women and duties performed by her at home front and at work ensuing in gender-based discrimination, was organized with the attendees involving their participation. The activity made women's unrecognized & unnoticed efforts and her acceptance to subordination crystal-clear. With the purpose of acknowledgement of dignity of women, a demonstration highlighting how women are ignorant of their rights was presented. “Lack of awareness about human and behavioral rights like right to participate in decision-making, right to be respected, right to voice concerns, right to opportunity and most important right to lead a dignified life etc. 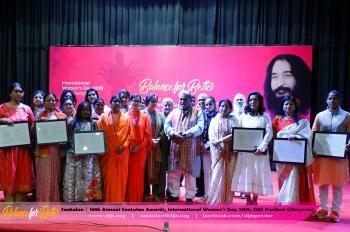 has led to increase in ever deteriorating status of women” said Swami Vikasanand Ji, disciple of Shri Ashutosh Maharaj Ji. 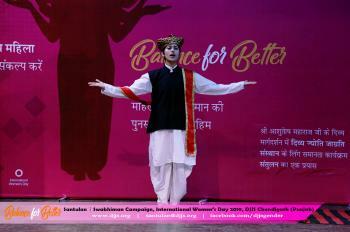 Further illustrating the case study of Rani Lakshmi Bai, emphasis was laid on need of understanding of self-worth in women’s life which is possible only through self-awakening, also a key to holistic empowerment of women. During the open discussion, a young curious student raised her hand and asked, "Is it possible to be like Lakshmi Bai in present era?" In response to the question requiring a universal remedy and capturing the objective of the workshop, Swami Ji explained that spiritual awakening inculcates much needed sensitivity in people's minds, make women realize their 'Astitva' and hence, contributes to their holistic empowerment. The School Principal, convinced with the objective and socio-spiritual message, appreciated DJJS’s ceaseless efforts to galvanize actions to eliminate violence against women and offered to organize similar workshop with the students' parents also. 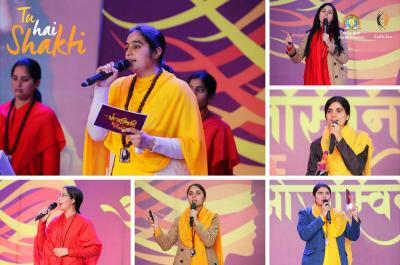 The sansthan with its vision to establish world peace through socio cultural psychological and spiritual tools, is working incessantly in domains such as holistic education, drug abuse eradication, gender equality, environment conservation, community health, disaster management, Indian cow breed improvement and conservation and empowerment of prisoners and disabled, to name a few.